When our shop is at maximum capacity, we want to continue to take orders by passing orders along to trusted partners when they are slow. When our shop is slow, we would like to keep our employees working with work from other shops at capacity. Why not help each other succeed, grow and benefit together? 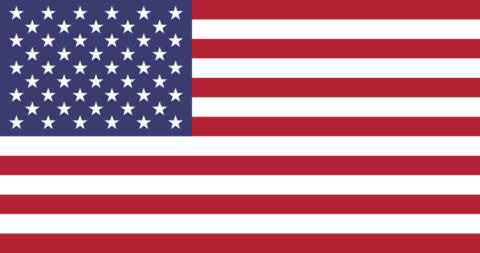 We believe this kind of forward thinking is instrumental to business success, improved customer service and strengthening our collective ability to bring manufacturing back to America. Fancy rhetoric aside, it's a no cost, easy win-win and the right thing to do. It costs nothing to work together. Attention Shop Owners: If you are currently looking for work, this is an easy way to win some orders. If you’re currently booked and turning work away, it’s an easy way to make a fair margin from your customer, if you pass it along to a network participant. Please read below to better understand how simple and easy this is and how it can help you grow your business. – Keep the doors open during slow times. – Create a steady flow of work. – Increase your shop capacity. – Increase exposure, SEO & Google ranking. – Costs nothing. Leverage our Marketing $. + Send/Receive NWR (New Work Request). + Max. price pre-approved by customer. + On-time delivery incentive program. + NDA, Terms and conditions. – Mandatory 2 week delivery. – Must be a Full-Service machine shop. – Payment Terms are NET 30. When there is extra work beyond our capacity, we will send out a NWR to you. NWRs are different than an RFQ because they already set the maximum price accepted by the customer. NWRs are an attempt to reduce time and effort when negotiating pricing between three parties; the customer, us and you. Rather than send quotes back and forth between us, and then back to the customer for approval, we found through experimentation that it’s best to receive customer approval of the price, then find a vendor who can do it for the price. NWRs will be sent with a maximum price, quantities, delivery date and documentation package. Quick and effective communication is critical to success. First Response: 3 hour max. response time; will acknowledge receipt of NWR and submit questions/comments. 24 Hour Accept/Decline Response; vendor must submit simple one-word response, “accept or decline”. Eventually, an online portal will make this quick and easy. Business as usual; Parametric will submit a PO and documentation package when NWR is accepted. 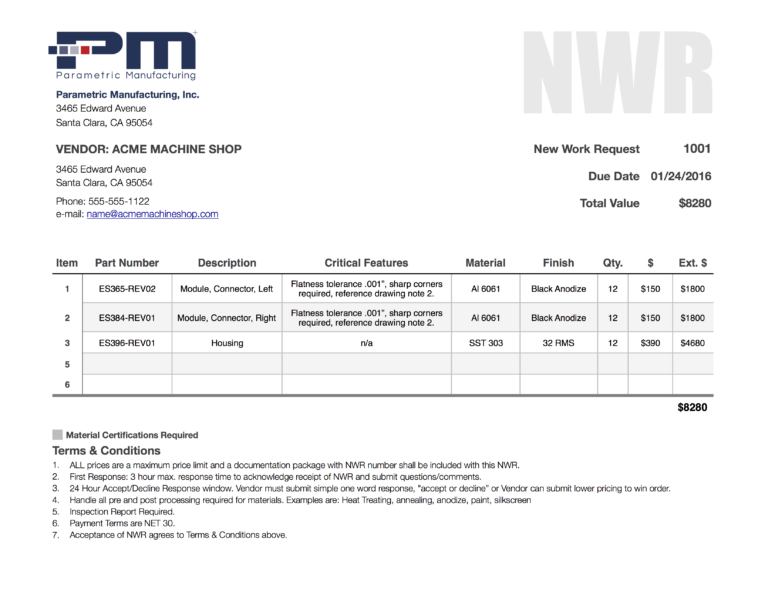 The NWR prices are 20% below the customer sales price. This provides a 20% margin for booking the order and passing it along to another shop. By working together as a network of shops, we can offer improved lead times, reasonable pricing and increased reliability that earns customer loyalty and recommendations within a diverse set of industries in Silicon Valley, the Bay Area and California. We are taking a leadership position to assemble a group of top shops in Silicon Valley to strengthen our abilities to better serve our customers, increase sales and delivery performance. For all participants, rather than turn away orders when shop capacity has been exceeded, we can pass them to those in our network that have extra capacity. Maybe your shop needs work and this makes a whole lot of sense. Or maybe your shop turns work away sometimes and would like to find a way to fulfill those orders and make a fair margin because they are your customer. Either way, it makes business sense for all of us and perfect sense to better serve our customers. Though we are starting in our local region of Silicon Valley, the vision is to eventually grow and evolve this concept to better serve the semiconductor, medical, fiber optic, electric vehicle and aerospace industries nationwide. Competitive pricing and accurate beautiful parts delivered on time are what wins orders. Dependability, engineering support, cost reduction through DFM and enjoyable people to work with are the driving factors to earning customer loyalty and sustained business growth. 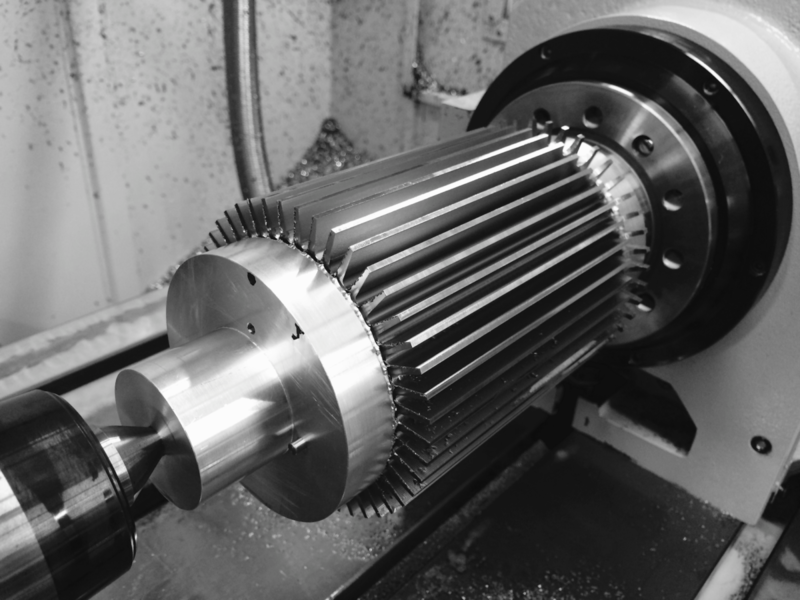 Very few business owners have experienced what it’s like to be a machine shop customer. Experiencing late deliveries and inaccurate parts are frustrating and resentful. They need someone to depend on and though we all do our best, we fall short for reasons that may or may not be in our control while the customer will never understand how hard we work or how difficult it may be to produce their parts quickly. Operating beyond shop capacity in fear of losing revenue stems from a scarcity mindset. Shifting to an abundance mindset by working together as a network of shops, we can address these issues head on, offer improved lead times, increased reliability while improving our business cash flow with a more normalized flow of sales while never leaving money on the table. Lastly, everyone wins. The shop at max. capacity makes a fair margin for their customer order while passing it along to the shop that needs the work during a lull and the customer receives beautiful parts in 2 weeks or less. Why would any shop owner not want to achieve that? Plus, it’s simple and follows standard business practices with a slight NWR twist. If we are all on the same page and expectations are set first, then we can all expect smooth transactions. 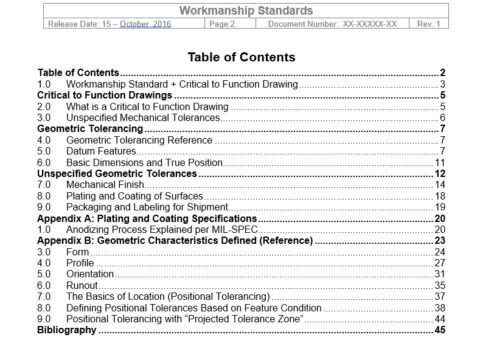 The purpose of a Workmanship Standard is to provide a tool that sets expectations and interpretations of drawings according to the standards of ASME-Y14.5, ANSI B4.1, ANSI B4.2 and industry best practices. Like a normal customer, from time to time, we will give you work and it costs you nothing more than what you are already doing. The only difference is agreeing to quality, delivery and workmanship terms while using a NWR form instead of RFQs.